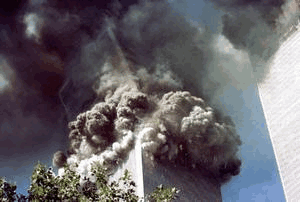 Here is part one of a series of seven short videos dealing with each step of NIST's "collapse Initiation sequence" for the Twin Towers. They're mainly comprised of footage from Kevin Ryan's 2006 presentation 'A New Standard for Deception' and the presentation he gave at the 9/11 Toronto Hearings in 2011. Tony Szamboti, David Chandler and excerpts from 'September 11 - The New Peal Harbour' by Massimo Mazzucco are also featured in the videos. I hope they'll be a useful resource to share with others. in Marin County, (San Francisco Bay Area) California, Saturday January 18th on Cable CH 26 at 8:30PM. Here it is! The final ad for the 9/11 global campaign! The “metro” version of the ad is one of several that are being developed for various types of outdoor media. The highway billboard version will be much simpler. 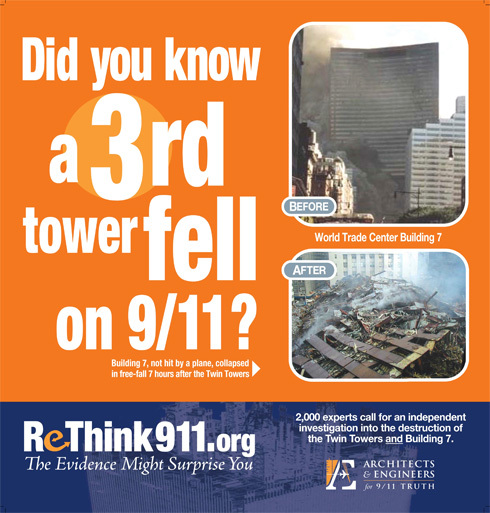 Read the fascinating story below about the design and polling of the ReThink911 ad. Yes… you read that right: $600,000. ReThink911* (a.k.a. Operation Tip the Planet) has raised $300,000 in pledges to match every dollar YOU raise by July 31 for this massive September advertising campaign. Will this simple UK courthouse set the stage for an extraordinary court case involving the AE911Truth evidence? Join our Membership Phone Team and enjoy the rewards that come with supporting our vital mission; AE911Truth activists Tom Spellman and Wayne Coste make a breakthrough at a major Catholic conference. Announcing Our New AE911Truth Membership Opportunity Join Us Now! I hope my letter finds you well! After an incredible year at Architects & Engineers for 9/11 Truth, we are finally getting close to a tipping point! Outreach is getting easier. More people are receptive to our message. Our milestone documentary, 9/11: Explosive Evidence – Experts Speak Out became the #1 Most Viewed and Shared video on the PBS.org website during the week of the 9/11 anniversary (84,000 views in one week!). Help us push this media wave even higher! Over the past several days you have helped us regain the slipped ground at on PBS’s website since we achieved #1 Most Watched and Most Shared rankings with Colorado Public Television (CPT12)’s showing of “9/11: Explosive Evidence – Experts Speak Out.” Thank you so much! As of this writing, your efforts have pushed us back up to the #2 Most Watched spot, after dropping for a time to #8. We have always retained the "1 “Most Shared” spot, suggesting that people who see the explosive evidence are much more motivated to share it with others than are those who watch other PBS online previews and programs. That certainly does not surprise us … and it’s another point we can all make to help encourage the media to give us more and better coverage. Action Alert: ESO Rockets to #2 on PBS in Just Three Weeks! Help Us Take It to #1 in Three Minutes! ESO Rockets to #2 on PBS in Just Three Weeks! Help Us Take It to #1 in Three Minutes! Click to Watch It Now and Push It to #1! As reported in the Digital Journal, our long-awaited documentary video "9/11: Explosive Evidence - Experts Speak Out" is finally getting some of the attention it deserves from the highbrow US television audience. As Tori Alexander notes, "PBS is the first major network to air the program," which has already rocketed in PBS rankings from #6 in views and shares last week to number #2 just yesterday. Even if you have already watched ESO on DVD or as part of the 2012 World Premiere tour, watching it online at CPT12's website will reward Development Director Shari Bernson and the CPT12 board of directors for their courageous choice to bring the explosive World Trade Center evidence to their viewers yet again. Click this link to watch the video. Click the Facebook, Twitter, and/or email icons at the bottom of the video image — — to share the video with your family, friends, and professional colleagues. Gear up for September 11th outreach! Take advantage of our “Experts Speak Out” DVD special offer! for $21.95 and receive all the following AE911Truth resources FREE!